Bring the party poolside, to the beach, or wherever you go this summer with the White Clip 3 Portable Bluetooth Speaker. At 5.4 inches, this compact Bluetooth speaker streams music from your phone or tablet and even features noise-cancelling speakerphone technology to allow for clear phone calls. This speaker is water-resistant and able to withstand being submerged in up to 3.3 feet of water for 30 minutes thanks to its IPX7 rating. This portable speaker is designed with a built-in carabiner clip, so you can easily attach this speaker to your backpack, belt loop, and more. 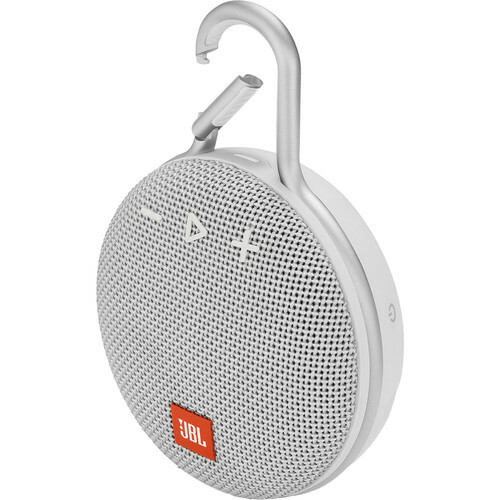 On a full charge, the JBL Clip 3 gives you up to 10 hours of playback, but if you use the included micro-USB cable you can recharge the speaker, so the music never has to stop. Don't worry if Bluetooth is not available, plug an audio cable into the JBL Clip 3 and enjoy your music all the same. The fully integrated metal carabiner is designed to protect the speaker from damage and allows you to easily hook the speaker onto your backpack or belt loop. The LED indicators inform you when the speaker is low on power, charging, in pairing mode, or receiving an incoming call. It also notifies you when the speaker is not connected via Bluetooth or if you are taking a phone call. Box Dimensions (LxWxH) 6.85 x 4.45 x 2.15"
Clip 3 Portable Bluetooth Speaker (White) is rated 4.0 out of 5 by 62. Rated 5 out of 5 by Manofchap from Whoa. Tons of great sound come out of this little thing. Great for bringing on golf outings and the beach. I also use it while traveling for a white noise machine. Love it. Rated 5 out of 5 by sophie15 from AWESOME SPEAKER!!! I bought this when it first came out and... wow. It's such a good speaker & still super tiny and portable. I've gotten it wet and it still works perfectly. The sound is great and pretty loud. I recommend to get this if you listen to music & walk because you can attach it to pretty much anything with a loop. I took this on a beach and some sand got into the speaker but it easily came out. This speaker is great, and easy to use. I would love to see the next speaker of this line be compatible to link up with multiple speakers to play as once and be louder. Rated 5 out of 5 by Thespeakerguy from Great Speaker I bought this and it has been good for at least 4 months. Its great with sound but my speaker has a red light on top that wont turn off! I cant use the speaker because of this and i am very disappointed about it. I hope to be getting it fixed. A full charge should be attained in about three (3) hours. Would this work with iPod 4? I'd like to give this as a gift. IPod 4 has Bloothtooth 2.1. Does that matter which version of Bluetooth your MP3 player has? Hi! Bluetooth is backwards compatible so it should not have any problems in pairing with your iPod 4 via Bluetooth. How do I recharge the clip 3. What are the 5 lights on the side for ? You'll need to use the charging cable that came with the Clip 3. The Light will turn into a solid red when charging and will turn off once fully charged.